Few cars this year have generated as much of a buzz as Porsche’s new 718 series. The move from sonorous flat-six engines to downsized flat-fours has gone over well with some, while others see it as a dilution of the essence of a Porsche. The Subaru-style flat-four boxer engine already features in the Boxster convertible, but now Porsche has applied the same updates to the Cayman and rechristened it the 718 Cayman. It went on display to the world at the Beijing Motor Show. Entry-level cars come with a 296bhp 2.0-litre unit, while the faster 718 Cayman S comes with a 345bhp 2.5-litre. 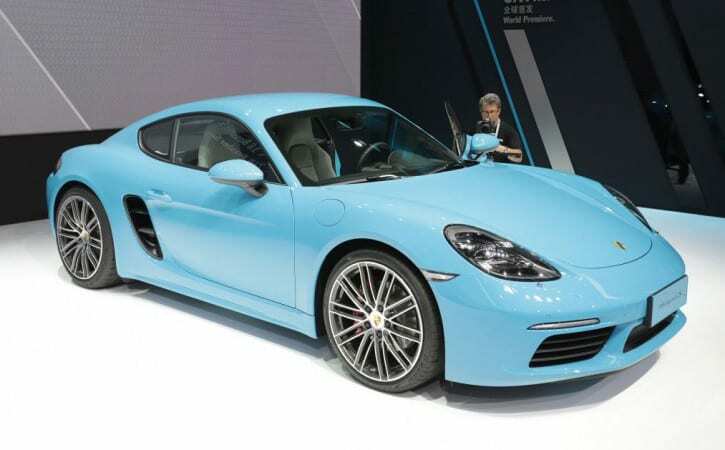 Both are turbocharged, and Porsche claims better performance and far superior fuel economy. It says the standard 718 Cayman covers 0-62mph in 4.7 seconds, with the S taking 4.2 seconds. They will hit 170mph and 177mph respectively. The chassis hasn’t been left alone either, and changes include updated springs and dampers, plus the addition of wider rear wheels and quicker steering. Also, the Cayman undercuts the Boxster for the first time, with prices from £39,878. It’s on sale now, with first deliveries in the autumn to drive down CO2 emissions, the Stuttgart-based sports car firm will introduce turbocharged flat-four boxer engines for the first time in the Cayman and Boxster.